RED 5: Who Needs Publishers? Former World of Warcraft team lead, Mark Kern, believes publishers are useless and consoles are dead. "Who needs publishers any more? I certainly don't. I couldn't care less about them at this stage," he told Eurogamer. "You're either an indie game or you're a massive AAA, IP-backed sequel with derivative game play that's rehashed over and over again as it's the only safe bet you can make when you're spending hundreds of millions of dollars." Kern, who's worked on most of Blizzard's top-tier franchises, left the company back in 2005 to form Red 5 alongside fellow former Blizzard employees, William Petras and Taewon Yun. 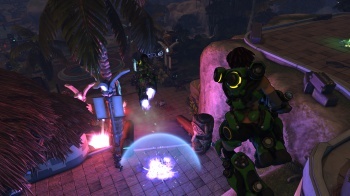 The company's only project to date is upcoming MMO/Shooter Firefall. Kern voiced concerns that the industry's "hit-or-miss" development strategies are stifling creativity and forcing smaller developers out of the business. "The failure is that there's no middle ground. All the games in the middle that could have been made but have been squeezed out and we've seen all these independent studios get closed down over the last few years." He also claimed that the massive costs involved in developing and maintaining current-generation consoles are going to be the death of the format. "It takes billions of dollars of investment to create a console and then you have to milk it for five to seven years in order to get your money back," he said. "So something has to change. Consoles, I believe, are dead."